A platoon of the new bike-share bicycles in Centennial Park in East Arlington on June 30. Our sleepy town has suddenly become a hotbed of experimentation in transit and public space, raising both hopes and eyebrows. 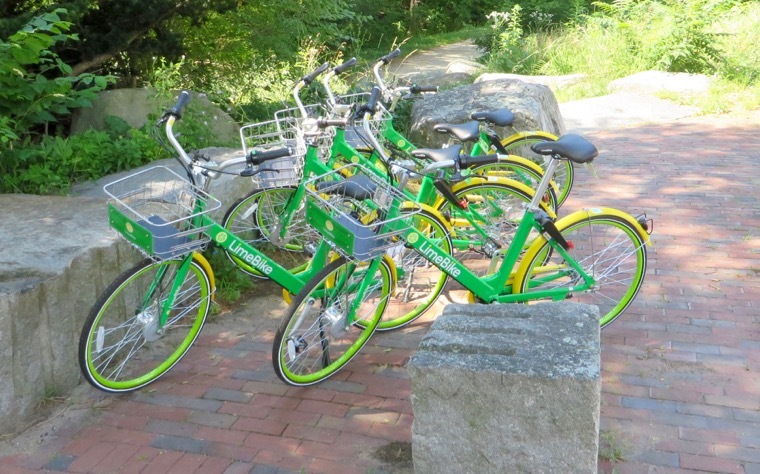 A dockless bike-share system, Lime Bike, debuted last week, and the distinctive yellow-and-green two-wheelers can be found all along Mass. Ave.
For a month this fall Arlington will try out some changes to Mass. Ave. to speed buses on their way during the morning rush hour. Further up Mass. Ave., in the center, Whittemore Park will see a 3-month trial run as a beer garden starting in a few weeks. 25% hearing transcript 25% plans 75% plans 100% plans Alewife paths Bates Beer bicycles bike lanes bump-outs business Bus priority Bus stops Center committee construction crash cut-through traffic cycling easements erosion FDR Foster funding history Lake Lake-Minuteman lane configuration lighting links Linwood Marion MassDOT hearing median opponents Orvis parking pedestrians Phase II (Center) post-construction press Question 1 s safety sidewalks signals street design streetscape Teel this blog Thorndike Town Meeting traffic Varnum Wyman St.